Summary: Scarlett loves the movies. But does she love sensible fiance David just as much? When she has the chance to house-sit in Notting Hill- the setting of one of her favourite movies- Scarlett jumps at the chance. But living life like a movie is trickier than it seems, especially when her new neighbour Sean is so irritating. And so irritatingly handsome, too. Review: A friend had mentioned a bit about 'From Notting Hill with Love Actually' and I instantly knew it would be my kind of book. Thanks to Julie, who lent me her copy, I finally got to read this rollercoaster novel. This is Ali McNamara's debut book and after laughing, crying, nearly missing my stop on various buses and staying up until all hours, I finished it. Having read Scarlett's wonderful story, I now await her next novel. Scarlett O'Brien is a loveable character and you cannot help instantly falling in love with her. Each and every one of us has a dreamy place we escape to from time to time and this book is based on that. The novel is written predominantly in Scarlett's point of view as she's telling us the story. The pace and tone is very chatty, from Scarlett with her new friends asking lots of questions. Scarlett is a business woman and considering she's a film fanatic her job is perfect. She works alongside her dad installing and repairing popcorn makers in cinemas. She is engaged to David who happens to run a fair few cinemas, but this is where David's attraction ends. In my opinion he is a bit of a boring character, but I'll let you be the judge of him. Maddie is Scarlett's best friend and, after a day of catching up, she can see her friend is troubled and confused so she arranges for Scarlett to house-sit in Notting Hill. 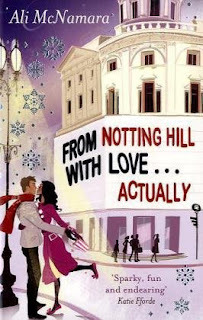 Now this is a rom-com come true for Scarlett as Notting Hill is her fave film. Everyone needs a friend like Oscar. He is the gay best friend every girl needs in life. He's an instantly loveable character. Will Scarlett work out her troubles? Or will she end up living her life through movie scenes? If you adore a good rom-com and you know all the stories from different films you will be blown away by the creativity of this book. It reminds me a bit of Moulin Rouge but instead of songs it's films and scenes from films. What I also thought was genius, was how frustrated I got with the characters. One minute I'm like 'for god's sake Scarlett choose properly', then I'm like 'Sean be a man'. It was just like watching a girlie movie, just in print. I kept getting angry with the book, just as we all do with films from time to time. I can definitely say that having read this book, I've now been recommending it to all my friends who love a girlie film. There was romance, a mystery, fun characters, and enough action to keep the pages turning. Very enjoyable read and highly recommended!